Earlier this year, a group of international students from the University of Tokyo Graduate Program in Sustainability Science Global Leadership Initiative (GPSS-GLI) visited Gojome, Japan in Akita prefecture. The student group, which included members from Japan, the United States, South Africa, Kenya and Russia, conducted field research as a part of a Global Field Exercise under the theme of “Rural Sustainability in Ageing Societies”. 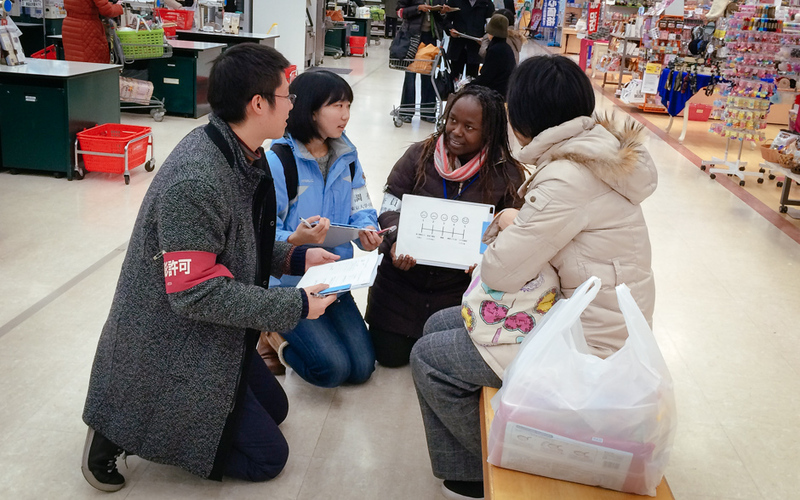 The field exercise targeted consumer behaviour and local retail habits in an effort to better understand the impacts of, and issues faced by, ageing populations in Japan’s rural areas. This article presents some of the field visit findings and student experiences from spending a week in Gojome. The view from Babame Elementary School is the landscape of rural Japan. Located in the town of Gojome in central Akita Prefecture, this beautiful scenery opens the imagination and seeds ideas about how one can learn from nature and seasonal changes by observing rice paddies and the local landmarks — the Babame River and Moriyama — that display new colors every day. But although Babame Elementary School has been located here since the late 19th century, today you will not see any students. Due to the region’s declining population and birth rate, the school could not recruit enough students and the building stopped functioning as an educational facility in 2013. Today it has the name Babame Base and the classrooms are offered for rent as office spaces. A number of companies and organisations are located there, including members of the Revitalisation Corps (Chiiki Okoshi Kyōryokutai in Japanese), a government programme through which young Japanese urbanites are dispatched to rural municipalities to help support local rejuvenation. It is one of the platforms for pursuing a goal of regional revitalisation, which includes creating attractive job opportunities, promoting rural tourism, strengthening primary industry, as well as inviting youth and working professionals to rural regions. With a predicted steady decline of Japan’s population, regional revitalisation has been among the top tasks on the Japanese government’s agenda recently. By 2030 Japan’s population is expected to fall more than 7% to reach less than 117 million. By 2060 the population could shrink to less than 87 million. But with this decline, the percentage of people over 65 years old is expected to grow steadily, reaching almost 40% by 2060. This shrinking and ageing population is especially apparent in rural areas. In 1991, the term genkai shūraku had already been coined, referring to villages that are at risk of disappearing due to depopulation. Like many other rural areas across Japan, Gojome is grappling with an ageing and decreasing population as younger residents move to larger cities. Since Gojome’s peak population in the early years of Japan’s rapid economic growth (1954~1973), the town’s population has fallen more than 50% to 9970 people — with more than 40% of current residents above the age of 65. Today the local government actively promotes Gojome, not only as a tourist destination, but also as an attractive place to migrate to for those who want to escape busy city life. This decrease in the number of vendors and customers is putting the tradition of more than five centuries and unique local products at risk of disappearing. 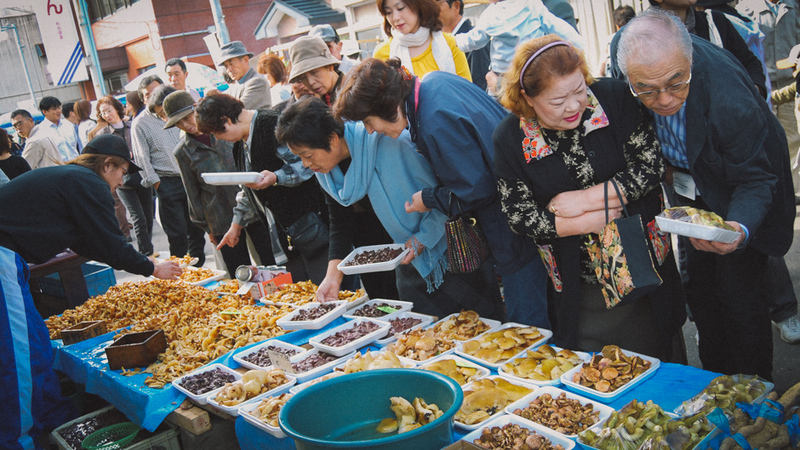 One of Gojome’s oldest traditions is the outdoor morning market (asaichi in Japanese) which has a history of more than 500 years. The market is open two to three times a week, but the number of market vendors is gradually decreasing. A woman who has been selling her products at the market for more than fifty years without skipping a day, told us that local residents used to buy ingredients for all of their meals at the market. However, Gojome’s changing commercial landscape and new consumer preferences have shifted customers away from what the morning market offers. Another vendor selling walnuts harvested in the local mountains said, “I enjoy talking to young people here”, when asked what he liked about participating in the morning market. But while market vendors enjoy their work, many commented that they do not have successors in their businesses. This decrease in the number of vendors and customers is putting the tradition of more than five centuries and unique local products at risk of disappearing. In contrast to the morning market, customers at Gojome’s main retail outlets, such as the national chain store Aeon, the local grocery store Daisan and the roadside rest area Michi-no-Eki also have concerns about how the ageing and shrinking population might influence their lives. The issue raised most often was future accessibility of consumables. “Most of us here depend on personal cars for transportation. I am worried that in the future it will become difficult for me to go shopping”, said a female customer at Aeon. Customers from the community of Sugisawa, located in a mountainous area of Gojome, explained that most of them rely on either taxi services or the community minibus as the main means of transportation for their daily activities because the number of public buses is limited. But retail outlet customers also expressed that the traditional morning market has both commercial and cultural value as it serves as a venue for seasonal festivals and traditional events. At the morning market, vendors display seasonal vegetables, locally harvested mountain herbs, mushrooms and homemade pickles, many of which are unique to the region. Although large-scale retail stores might be perceived as competitors to the morning market, they also have the potential to contribute in their own way to saving and further promoting local products and traditions. For example, morning market vendors and local farmers have also started displaying their products at Aeon and Daisan. “I’d like to continue connecting consumers with producers by collaborating with local farmers and selling their products”, said Mr Hajime Miura, Director of Daisan. Along with retail businesses, many local producers also run their business in a way that allows them to give something back to the community. For example, one of the conditions for employment at a local sake brewery, Fukurokujyu, which has been operating in the area since the late 17th century, is to be a resident of the town. The brewery president, Mr Kouei Watanabe said: “I want my employees to produce sake while experiencing the local climate and environment”. The mission of his business is to make local residents proud of their homeland. “My wish is for local people to proudly say to others that it is sake from their hometown,” continued Mr Watanabe. Another example is a family woodcraft business run by its third generation owner Mr Tomoaki Sato, who is working towards branding and promoting products made of locally grown cedar. His aim is not only to contribute to the local economy but also maintain Gojome’s forestry industry and restore the natural environment of the mountains. The population in Japan is predicted to decline steadily in the future and with prolonged life expectancy and low birth rates the share of elderly population is expected to increase. It is easy to get discouraged by looking at these projections. However, today in the era of increased mobility and information exchange it is becoming possible to be connected and support communities in places such as Gojome. It can be done by purchasing products from the area, donating money for local projects, as well as visiting and sharing information about these places. These new forms of urban-rural experience, which do not always require people to travel to rural areas, can become key approaches in overcoming the issues brought by changing demographics. One of the projects based on the idea of connecting people to the area without requiring their constant physical presence there, is a Share Village Machimura project in Gojome. By contributing an annual fee, which is used for the maintenance of the traditional Japanese-style house, anyone from outside can become a “villager” and can come for a stay whenever they like. A similar platform called Dento Supporters (dentō is a Japanese word for “tradition”) has been launched to support craftspeople working in traditional industries. The members of the Gojome Revitalisation Corps also work towards connecting the local community to people and markets outside the area through branding and promotion of local products and services. Their initiatives include promotion of local products such as raspberries, support of female entrepreneurs, reutilisation of abandoned houses for community cafés and art exhibition galleries. Such projects provide new forms of rural-urban linkages which can offer opportunities to those outside these communities for communication and learning, for example, by participating in rice planting and harvesting. This has potential to create connections and attachment to a certain area or practice. What is more important, these experiences can trigger people’s decisions to migrate from urban to rural areas. These new forms of urban-rural experience, which do not always require people to travel to rural areas, can become key approaches in overcoming the issues brought by changing demographics. Retail business, local producers and customers across Japan and even abroad all play important roles in establishing these connections between cities and rural areas. It only requires remembering that your daily choices have power to influence lives of other people and shape society as a whole. This article had additional input and review by Masafumi Nagao, and Izumi Ikeda. We would like to express our sincere gratitude to the Gojome Town Office and members of Gojome Revitalisation Corps for their help and support during fieldwork. 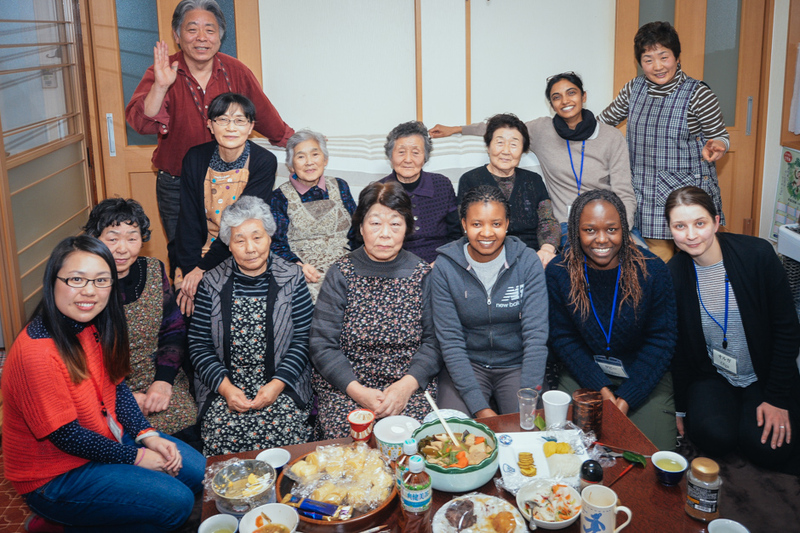 We are indebted to Akita International University students who facilitated communication with key interviewees and local residents, and acknowledge that without their tremendous help, our data collection and communication with local people would not have been possible. We would like to thank all the interviewees who kindly agreed to share their time and knowledge with us. We are grateful to the residents of Sugisawa community for their hospitality and for introducing us to local food. We also would like to thank all the residents of Gojome for their warm welcome and for sharing their stories with us. Creating Urban-Rural Connections to Preserve Traditions in Ageing Communities by Olga Tyunina, Tabitha Olang, Merle Naidoo and Shogo Kudo is licensed under a Creative Commons Attribution-NonCommercial-ShareAlike 4.0 International License. Olga Tyunina is a doctoral student in the University of Tokyo Graduate Program in Sustainability Science – Global Leadership Initiative (GPSS-GLI). Her research interests include environmental activism, public participation in environmental policy and sustainable agriculture. Tabitha Olang is a master’s student in the University of Tokyo Graduate Program in Sustainability Science – Global Leadership Initiative (GPSS-GLI). Her research interests include renewable energy, financial inclusion and rural development. Merle Naidoo is a doctoral student in the University of Tokyo Graduate Program in Sustainability Science – Global Leadership Initiative (GPSS-GLI). Her research interests include sustainable business solutions, adoption and use of green technologies, eco-cities and sustainable living solutions, waste management (reduction, recycling and reuse), natural resources management and conservation, sustainable development and poverty alleviation projects. Dr Shogo Kudo is a project researcher with the University of Tokyo Graduate Program in Sustainability Science Global Leadership Initiative (GPSS-GLI), Graduate School of Frontier Sciences. His fields of expertise include sustainability science, ageing studies, rural studies, social research methods, and qualitative data analysis.